Andrew has been eating food for about a week now! 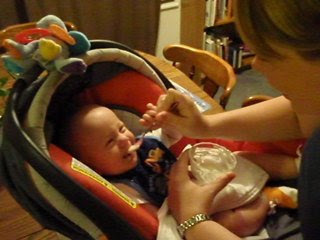 These are picture from his first chow-down! I was debating on when to start him on food and after one night of him waking up at 4:00 b/c he was hungry I started him on food the very next day! He LOVED it! We don't normally feed him in his carseat, we were just at friends house and it worked great!